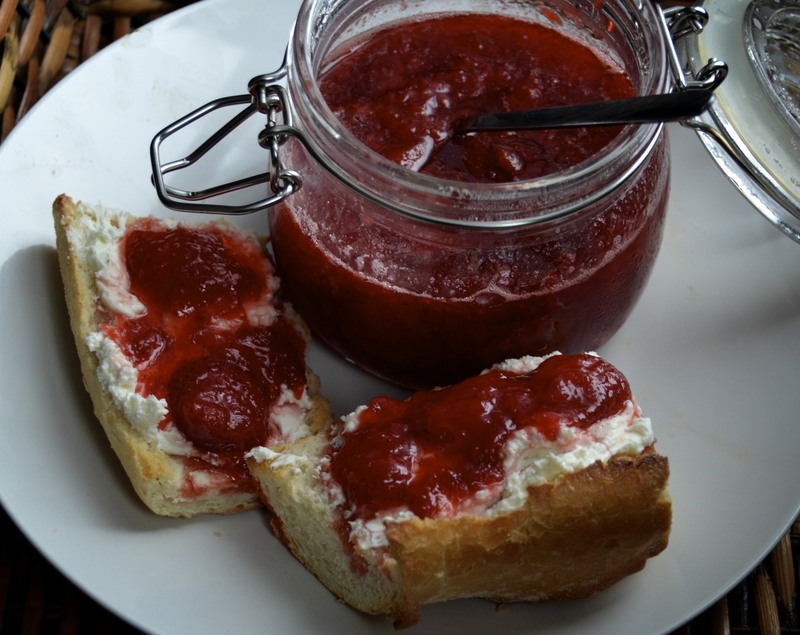 I am seriously addicted to homemade strawberry preserves. This is my second batch because the first went so fast I didn’t get a chance to take any pictures. It is really one of the simplest things to make and the taste is so much better than store bought. It’s also nice because you can control the amount of sugar you put in. These preserves will also make a great holiday gift. Place strawberries in a large stainless steel pan. Cover with sugar and let sit 3 to 4 hours. Turn heat to medium and slowly heat up strawberries. Add lemon juice and vanilla. Bring mixture to a boil. While strawberries are cooking, place a small plate in the refrigerator to chill. After 15 minutes, remove strawberries from heat. Remove chilled plate and place a small amount of strawberry mixture on it and let sit for about a minute. Run your finger down the middle of the strawberries. If the mixture runs together cook a little longer, and test in about 5 minutes. If the mixture does not run together, you can now pour it into a sterilized jar. If your not sure how to sterilize your jars properly, you can find some information here.